The latest BG3 single package SSDs feature the M.2 2230 removable module and will be available in 128GB, 256GB, and 512GB capacities. The NVMe technology provides sequential read speeds of up to 1,520 MB/s. 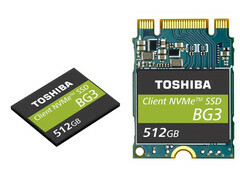 The BG line of products from Toshiba is mainly intended for OEMs that directly solder single package SSDs in mobile devices like laptops, so you probably cannot find these at e-tailers such as Amazon or Newegg. Toshiba’s latest BG3 single package NVMe SSD series now features the M.2 2230 (removable module) form factor, which allows OEMs to provide upgrade options. With the NVMe feature, Toshiba intends to offer an alternative to the low-cost DRAM-less SATA SSDs. In this respect, the BG3 SSDs reserve up to 38 MB of system RAM on a Windows 10 device that supports the Host Memory Buffer (HMB) feature, and the benefit of this small trade-off is sequential read speeds of up to 1,520 MB/s. Toshiba claims that the new single package NVMe SSDs should perform 80-150% better in random access at high queue depths, compared to DRAM-less SSDs. “The BG3 series is not only smaller and lighter, but smarter thanks to its cost-effective DRAM-less design with HMB technology combined with Toshiba 64-layer 3D flash memory with TLC technology. These SSDs enable OEMs to reimagine what’s possible for their customers.” The BG3 will be available in 128GB, 256GB, and 512GB capacities. The new SSDs are now sampling to OEMs and will be demonstrated at the Flash Memory Summit 2017 in Santa Clara, CA, from August 8 to 10.